Review: "Lucid Dream" is once again one of those movies that make it difficult to write a review. Is the movie bad? No. Could it have been better? Yes, by a lot. For sci-fi fans it surely will be disappointing that the dreams may stand as an important element within the story, but merely serve the purpose of being a tool for searching for the vanished son. Therefore, being your standard crime story the movie simply works on the surface of what could have been an innovative and smart crime thriller. And to make it worse the director also can't help but clearly copy from the much more profound "Inception". So you never really know whether the movie is really aware of what direction it is heading or not. And the plot's premise of dreams is never made use of the way it would have been desirable. When it comes to dream worlds there aren't just philosophical ideas that can be implemented into a story, but you can also feature quite some different action scenes. "Lucid Dream" isn't interested in neither. Thus, disappointment is soon setting in when we watch Dae-ho running after one hint after the other. At least the story keeps going forward this way. However, director and writer Kim Joon-seong apparently doesn't feel really secure with this alone and for that reason coincidence is playing a major part in the movie. And at times this even becomes a bit ridiculous. The (copied) idea to enter the dreams of others is implemented via a nameless man sitting in a wheelchair - played rather mediocre by Park Yoo-chun ("Haemoo") - but it's mere coincidence that leads Dae-ho to him. 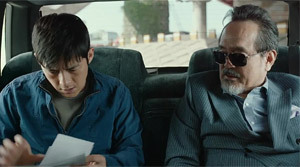 Ko Soo ("Way Back Home") convinces as a father who cares about nothing else but finding his son. Especially in the more dramatic moments he manages to deliver a nice performance. Disappointing on the other hand is the portrayal of the detective by Sul Kyung-gu ("Hope"). Being written particularly shallow is the role of the female physician, though. Contrary to that there is an elderly private eye who makes the movie a bit more colorful. Also deserving some praise is that the villain actually has reasons for his actions. This makes "Lucid Dream" divert from your usual black-and-white approach. But all of this doesn't help when creativity is otherwise falling by the wayside. Moreover, there may be countless twists, but some of them are so closely intertwined with coincidences that it almost looks ridiculous. In the end, you probably should be thankful that the movie doesn't once again get stuck in becoming a flick in which corrupt politicians stand in the focus of events. Because there certainly have been enough movies of this kind this year already. 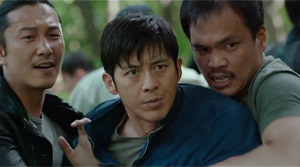 As a crime thriller "Lucid Dream" still somewhat lacks the thrill factor. As already said this isn't because of a lack of new revelations, and with its running time of 100 minutes the movie surely isn't too long either, but the individual parts don't fit together that well. The dream element isn't used that greatly either, or rather every time things start to get interesting we wake up from the dream. The filmmaker also doesn't toy with Dae-ho at some point not being able to differentiate between dream and reality anymore, even though at first there has been some foreshadowing in this regard. Accordingly, you have to ask yourself what kind of purpose the dream element actually serves in the movie. However, it needs to be pointed out that the film is well produced and manages to come up with some nice pictures. Especially the showdown, which naturally needs to take place in a dream, looks fascinating. The collapsing buildings may again remind us of "Inception", but the black-and-white pictures as well as the atmosphere created establish the necessary amount of menace and furthermore can stand as a mirror of the protagonists' psyche falling apart. But in order to really understand the movie that way it should have delivered more in storytechnical terms. And here is where the biggest problem can be pinpointed: Despite a nice finale with an outstanding set "Lucid Dream" is still just a mediocre crime thiller. Actually a movie you could recommend, the theme of dreams, which isn't used to its full potential, disappoints. But those who are looking for a detective thriller with a little bit more of an exotic note just have come to the right place.